Congress fixed the Section 45Q tax credit as part of a broader budget deal signed into law in February. It was a big, big deal. This incentive would accelerate technologies that capture, store and utilize carbon emissions from existing and new coal and natural gas plants, as well as industrial facilities that produce a range of U.S. products. The credit also applies to emerging direct air capture technologies (think machines that selectively vacuum CO2 out of the air). For background, Congress first established the 45Q incentive as part of the Energy Improvement and Extension Act of 2008. Over the next decade, it became clear that the incentive was not accomplishing what policymakers envisioned, leading to a bipartisan effort to make the credit more attractive for private investment. 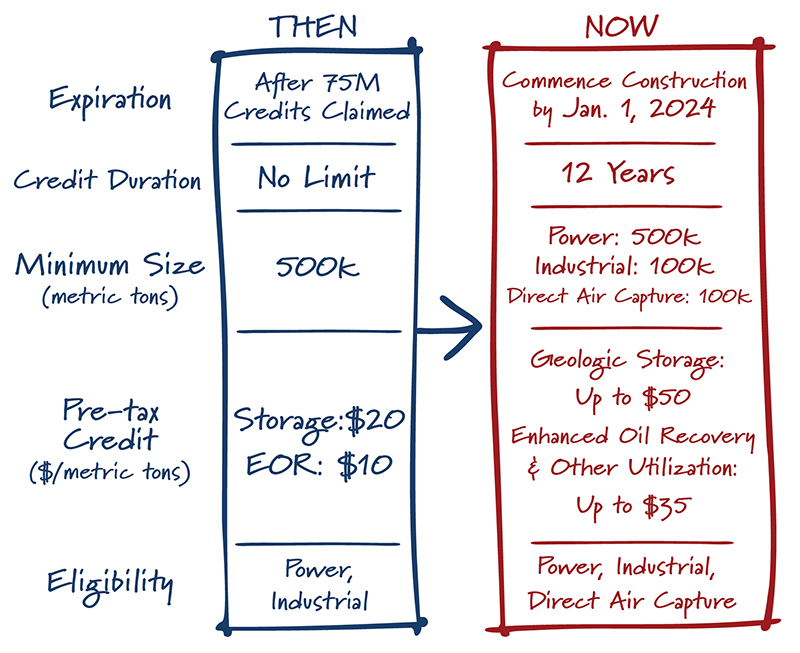 Among other changes, the recent update replaces an absolute credit cap with a deadline (in order to reduce developer uncertainty) and expands eligibility to smaller industrial facilities. That means more projects to capture carbon could be developed. That will enable more capturing of carbon for geologic storage. Proposed business models also look at economic opportunities, including utilizing CO2 for enhanced oil recovery and, in the longer term, manufacturing commodities such as sneakers, toothpaste and building materials like cement. Carbon capture, utilization, and storage innovation could be worth tens of billion of dollars – an opportunity that can be seized by the U.S. not just domestically but also in helping deploy these technologies abroad. That includes India, a serious player in global energy and climate change talks but also a country that imports three-quarters of its oil. Captured carbon will help them build a domestic oil supply through enhanced oil recovery. The Middle East – which amazingly still pumps natural gas into the ground to enhance recovery of oil – is also increasingly thirsty to mimic the U.S. in injecting CO2 into the ground instead for that enhanced oil recovery. Further down the line could be African nations prepping for electrification. But a really ambitious agenda is still needed to propel carbon capture technologies into the mainstream, drive down costs and instill sufficient investor confidence. The promise of carbon capture technology can’t rest on the recent 45Q fix alone. 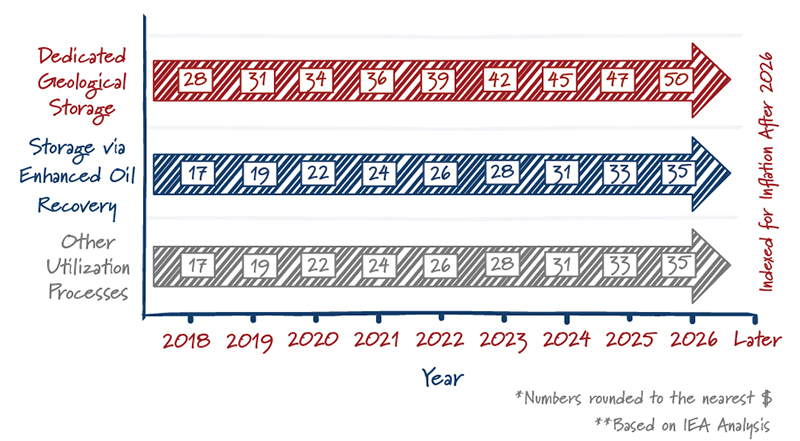 For one, the recent extension limits the start-construction deadline to just six more years. And even in the interim, we need more regulatory and policy reforms similar to the package of incentives and policy gateways that benefited the early days of wind and solar power expansion. Ensure steady and sufficient Department of Energy research, development AND demonstration dollars. Authorize federal private activity bonds, a structure that enables private-sector projects to attract capital at low public-sector interest rates. It’s quite a list. The good news is the 45Q fix was a major hurdle that was overcome and will be the anchor that drives a lot of these other needed changes. And politically, it showed the art of the possible in bridging hardened partisan divide, including on the always-sensitive subjects of climate change and domestic oil production. But we have a lot of work left to do to get these projects up and running at scale.